Details: The yard at Neasden Station can be seen from the platforms but a better view can be had from the footpath that runs along the rear. 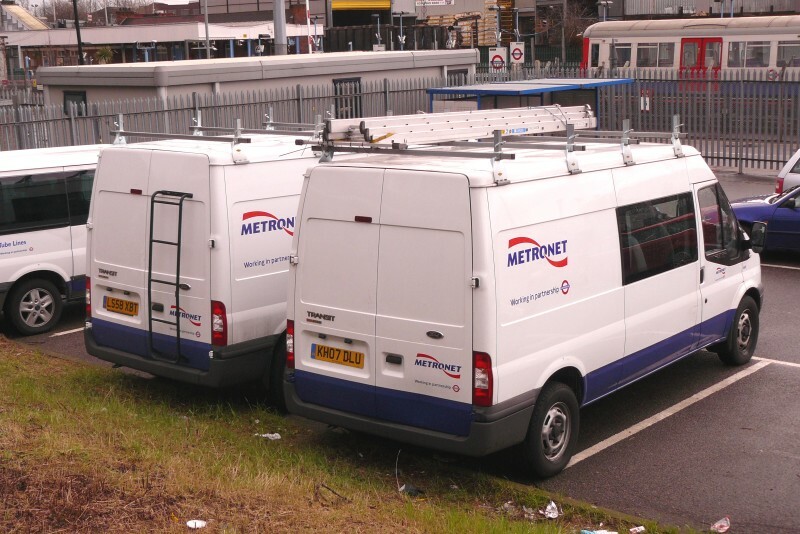 On 23rd January the residents included the usual Metronet Transit crew vans. Nearest the camera is 5998F, quite a low number for an 07 registered vehicle. Getting down to the minutiae, the ladder that was loaded on its roof rack was marked 'C&E Acton' on one side and 'P&E Acton' on the other! The differences between 5998F and similar but newer 6582F on the left are minimal. Apart from the rear ladder on the latter, there is the colour of the lower hinges of the back doors and the style of registration plates. 5998F has plates marked 'Bank of Scotland', while those on 6582F appear to read 'www.leasedrivevelo.com'. If the supplier of leased vehicles has changed, this could account for the return of London registration series (such as LS) after several years of using provincial ones (mainly starting in K).